Eliminate brake dust with a twist of the wrist! A total retail value of $16.98. Save $2.99! Works in hard to reach area! I've only used 1 time, and it worked very well. Handle will maybe pull out of foam too easy, but dont know yet. I discovered the foam can be reversed to get more use. Good product. NEIGHBOR HAD TO HAVE ONE! My neighbor was admiring this simple tool while watching me clean the wheels on my Ferrari 355 and Camaro RS. They asked me to order one for them and I did. 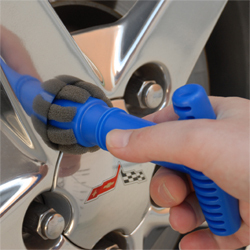 We are both pleased with this simple tool that addresses a long neglected and un-scrubbed part of your wheels that have exposed lug nuts located in recessed lug wells. ProsVery handy for a specific task. ConsFoam rubber sleeve slips off the tool handle when you pull it out. Simply put the tip of your finger on the sleeve when withdrawing it from the wheel and problem solved. Does not fit all wheels. Smaller wheel lug wells will not accommodate this tool. Larger diameter wheels tend to have larger lug nuts and lug wells. Works fine with those. 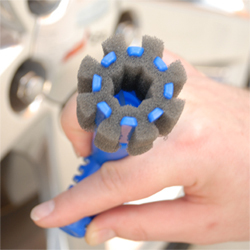 This is a well designed tool to add to your detailing arsenal. I've had it for a little while. It's the best I've encountered to get those hard to get to lug areas really clean. Like I say, great design. Kudos to the people that make this product. Definitely add it to your detailing supplies and you will be glad you did. Nita's described doesn't work on all sizes of lug nuts. Too big for aftermarket wheels and some stock ones as well.